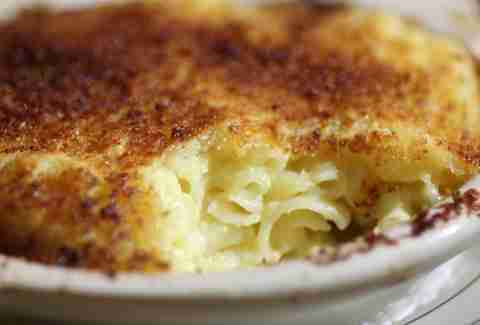 Mac and cheese is kinda like that blanket you had as a kid: it's simple and comforting, you've loved it for as long as you can remember, and there's probably a little piece of it somewhere in your apartment. 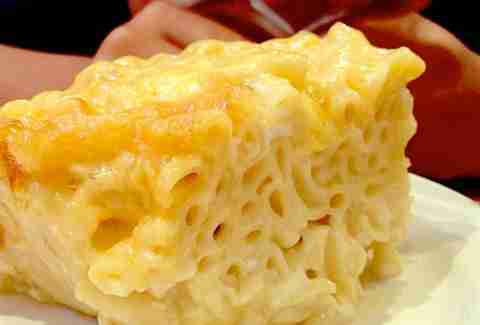 Making sure that little piece is the most delicious one possible: this list of the nine best mac and cheese dishes in LA. It's 214a. You've just left last-call at, say, The Dresden. 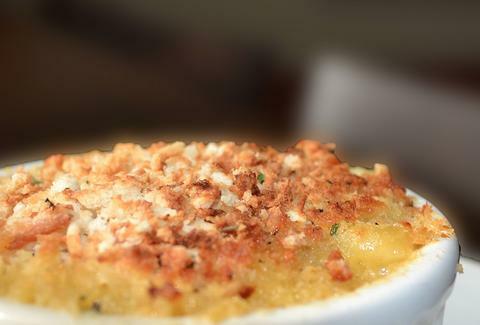 You want something fried, and carby, and preferably super-gooey and cheesy. And then you remember. 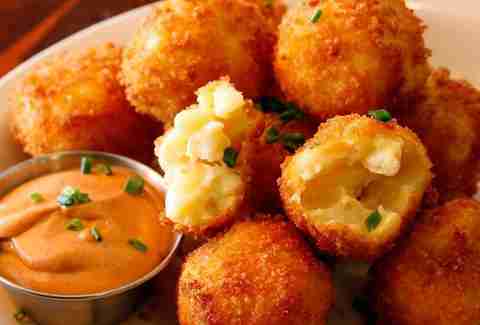 Fred 62 has deep-fried mac and cheese balls. The. End. 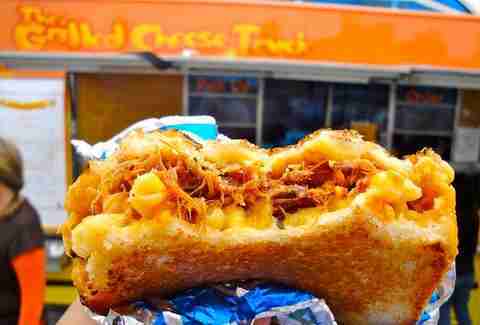 While yes, you could have a grilled cheese with pulled pork, you could also have that same grilled cheese with pulled pork STUFFED WITH MAC AND CHEESE. For rizeal, this Snoop Dogg (and Snoop Lion! 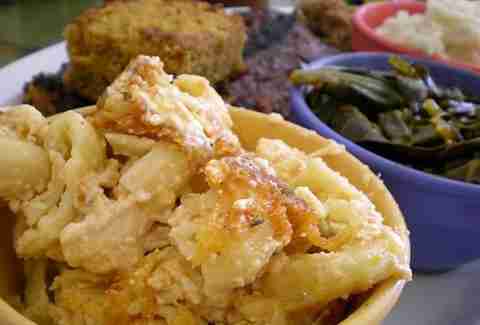 )-approved, Southern-classic serves up some of the best old-schoolish mac and cheese in town -- creamy and baked and delicious. 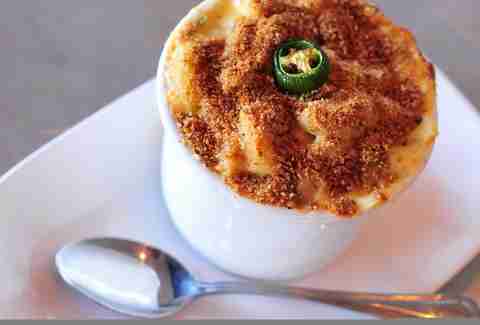 This Fairfax cafe spices up its pepper jack/cheddar mac with jalapeno and breadcrumbs. 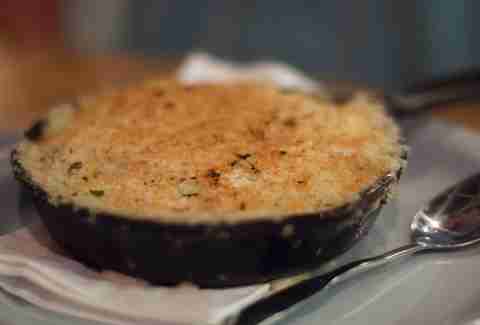 You can also optionally (hahahahahah, right) add crab and bacon. Like any delicious fort, Gruyere and beer're the base for this baked mac, which's also full-up with bacon, chives, and smoked chilies. This East Coast-style seafood shack from the Providence guy's got a crazy-creamy side of cheesy, cheddar-y mac. 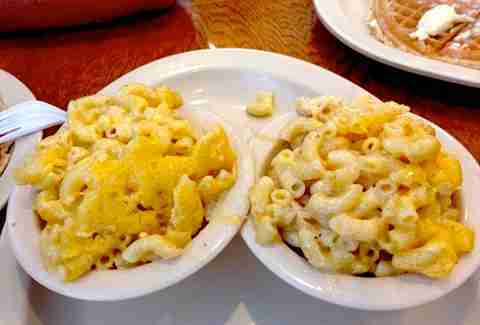 The beloved 3rd St cafe serves its mac and cheese in giant, square-shaped hunks because, delicious. This BBQ stalwart's mac and c gets its cheese foursome on with Parmesan, cheddar, jack, and blue. Track down this kinda-fakely-down-home cooking truck, and order up the Mack'n Cheeseburger, a full-on burger topped with -- you guessed it -- kale and radicchio mac and cheese and applewood-smoked bacon.